Home > Fish & Shellfish, Food Networking, Food News, Food Pictures & More, Healthy Food, Local Events, Recipes, What I Made Today	> Watching Angler Chronicles: Smoke Them If You’ve Caught ‘Em Sergio. Watching Angler Chronicles: Smoke Them If You’ve Caught ‘Em Sergio. 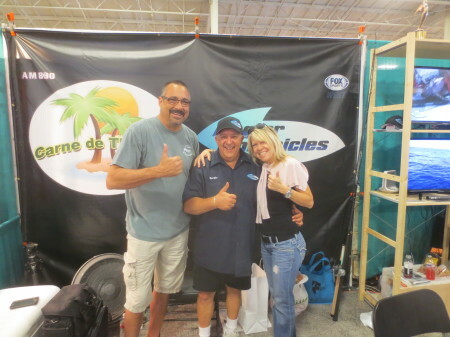 Have you seen Angler Chronicles on FOX Sports West Television? 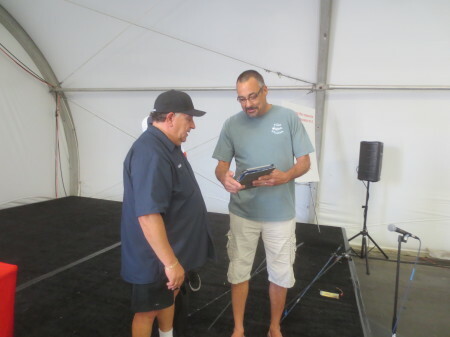 We’re with its host and accomplished fisherman, Sergio (above) at the annual Fred Hall Fishing Tackle & Boat Show in Del Mar. He’s a cool dude. Matt, a state record holding fisherman himself watches Sergio on Angler Chronicles every week and now I will too. The show brings viewers to the best wide open, fresh water and salt water sportfishing action on the west, including Southern California, Mexico, British Columbia, Alaska and Panama. We’d love to fish with Sergio and the gang sometime. Matt quickly showing Sergio his state record so not to be too much of a geek. The Angler Chronicles gang needs RECIPES — As Matt and possibly I catch more Fish, more recipes will be developed. 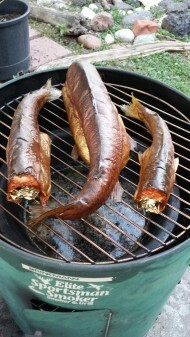 Until then, smoke them if you’ve caught them, as there’s not much better than fresh Smoked Fish. 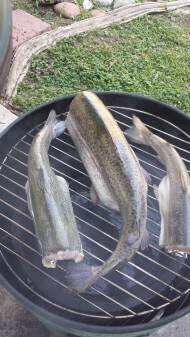 I recently smoked Rainbow Trout caught from Irvine Lake by a neighbor. After about 4 1/2 Hours of smoking with Hickory and Mesquite Wood Chips, every Trout no matter size was moist, smoky and cooked perfectly throughout (before smoking above left/after above right). TIPS: Stuff the inside of most whole Fish with foil to have the Fish set/swim upright on the grill, so you won’t need to turn them and they’re less likely to stick to the grill. Keep the Fish covered with smoker or grill lid. Maintain water in the pan above the heat and keep all smoking by adding coal and soaked and dry wood chips when necessary. Tips are good, but each smoker is different. RECIPES: Several recipes using Yellowtail are linked here. Keep checking Fish & Shellfish for more. Happy Easter From Kids In The Kitchen At Nibbles Of Tidbits. Dreaming Of A Pizza That No Longer Exists At The Getty Center.